Batting: Azhar Ali 50 off 136 balls , Shadab Khan 52 off 85 balls, Faheem Ashraf 37 off 38 balls, Babar Azam 68 off 120 balls, Asad Shafiq 59 off 100 balls, Haris Sohail 39 off 95 balls. Bowling: Ben Stokes 3/73 in 22 overs, Jimmy Anderson 3/82 in 26 overs, Stuart Broad 1/61 in 25 overs, Mark Wood 2/74 in 24.3 overs. Batting: Jos Buttler 66* off 130 balls, Jow Root 68 off 120 balls, DM Bess 55* off 101 balls. Bowling: Mohammad Abbas 2/36 in 15 overs, Mohammad Amir 2/35 in 17 overs, Shadab Khan 2/63 in 19 overs. Pakistan were pretty happy with the 166-run lead that they had amassed on on Day 2 of this test and they were hoping to make some more runs with Amir and Abbas on strike. Technically, Pakistan had two wickets in hand but as Babar Azam had been injured due to Ben Stokes bouncer, so England had to take only one wicket to end Pakistan’s 1st innings. Both Amir and Abbas were hoping to add at least 40+ runs so as to take the lead above 200 but that wasn’t going to happen. 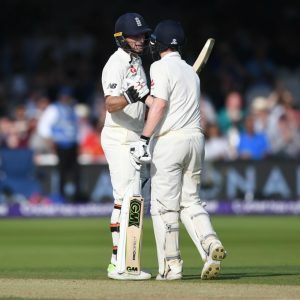 As, after surving 4 overs from England pacers, Abbas fell to Mark Wood as the English pacer delivered an accurate bouncer to force Abbas to edge out to Bairstow. And, with this wicket Pakistan’s innings came to an end. So, England were now trailing by 179 runs and their batsmen had a huge task ahead of them as they had to bat at least 2 days straight if they wanted to draw let alone win this match. 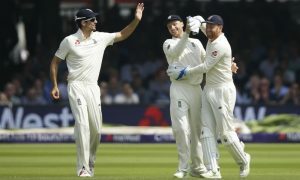 After the break, the test match resumed as the English openers, Mark Stoneman and the ravishing Alastair Cook got set on the crease. Amir was given the new ball by Sarfraz as Pakistan looked to cash on the pressure English batsman were in due to huge trail of 179 runs. 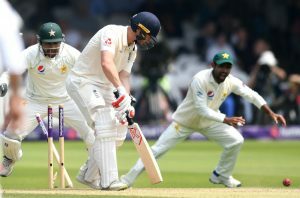 And, the pressure worked as Cook succumbed under it, courtesy of Mohammad Abbas’s exquisitive bowling as he took the wicket of the former English captain in his first over. 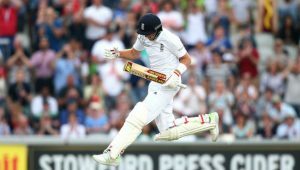 The English captain Joe Root now joined Mark Stoneman on the crease as Pakistani pacers looked to get another wicket. Sarfraz gave overs to Abbas, Amir, Hasan and Faheem but Root and Stoneman were unmoved as both batsmen had now shared 30-runs among themselves. The pair was looking threatning and this is when the Pakistani skipper Sarfraz gave the ball to Shadab and the young leggie delivered. As, he uprooted Mark Stoneman’s off-stump and gave Pakistan their 2nd breakthrough of the match. 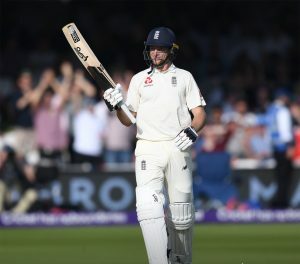 Joe Root was now joined by Dawid Malan and it looked like both of these batsmen had a point to prove. As, despite Pakistani bowlers missing several chances, these two batsmen managed to share a 50-run stand between them. They didn’t stop there as they took their partnership to 60 runs and Root managed to score a fifty in the process. Things were looking good between the two batsmen when then the Mohammad Amir decided to show his class as he forced Malan to edge out to Sarfraz and England lost their 3rd wicket. Bairstow, who had shown some resistance against this Pakistani pace attack now joined Root on the crease. However, after leaving alone the first ball, Amir struck for the 2nd time in his 10th over as he shattered Johnny Bairstow’s stumps. With this double strike by Amir, England were now 4 wickets down and were still trailing by 88 runs and Pakistan were clearly on top at this point. So, the next batsmen Stokes came out at this weak position as he and Root looked to build a solid partnership between them and at least narrow down the trail. But, Sarfraz knew a new batsman i.e. Stokes was on the crease so he stuck with Shadab and got rewarded as tow overs later the young man got his captain the wicket of Ben Stokes. 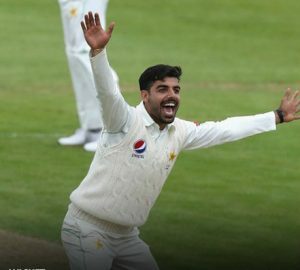 And, frankly Shadab deserved that wicket as Stokes had played a half-hearted stroke with no placement and that resulted in him giving the catch to Fakhar Zaman who took a comfortable catch at mid-wicket. Jos Buttler who had failed to make his mark in the 1st innings, now joined the English captain on the crease. 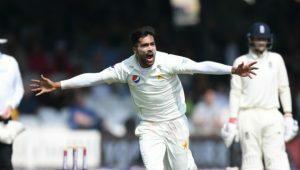 But, after only sharing a total of 6 runs between them, Mohammad Abbas struck as he took the prize wicket of Joe Root and sent him back to the pavilion. Now, DM Bess joined Buttler and Pakistan were certainly on top at this point as they looked to take the remaining four wickets and finish it off quickly. However, Pakistan Vs England tests are nail-biting for a reason and that is because there is talent present on both sides. And, that is exactly what happened here, as both batsmen began to play their shots and counter the Pakistani pace attack. First Buttler reached his fifty as DM Bess complimented him well from the non-strikers end. Not long after that DM Bess also reached his maiden fifty and it was huge acheivement for him as he had managed to score it on his debut. With this the 100-run stand also came up as both batsmen hugged each other to celeberate this acheivement. Pakistan needed wickets at this point but both these batsmen saw the day off as they remained unbeaten with 125* runs in between them. So, Pakistan dominated in most part of the day but the grit and composure that was showed by these two batsmen allowed England to end the day with a lead of 56 runs. End of 1st Test – Day 3 (Pakistan Vs England): That is it for today do join allsportspk tomorrow for the 4th day of this riveting test between Pakistan Vs England.